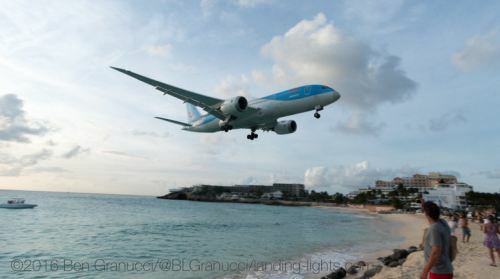 AirplaneGeeks 384 Plane Spotting with Ben Granucci - Airplane Geeks Podcast - The weekly audio podcast that explores and expands your passion for aviation. NYCAviation.com editor Ben Granucci on plane spotting, CEO change at Spirit Airlines, drone news from the 2016 CES, a new FAA app, the Airbus A350, hand flying the airplane, five-engine airplanes, and the odd-looking Northrop Tacit Blue. Ben Granucci inside Fedex A300 at EWR’s Airport Day. Photo by Maggie Bradley. Ben Granucci is the Standards Editor for NYCAviation.com, a New York City-based, globally focused aviation news, commentary, and enthusiast website. He is an avid aviation photographer and a lifelong avgeek. 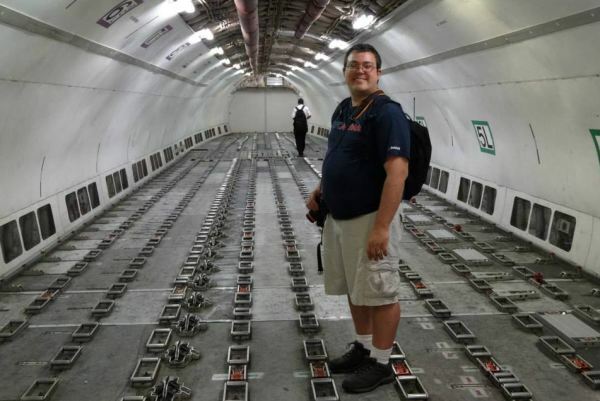 In addition to his work with NYCAviation, Ben also occasionally writes for AirlineReporter.com. Follow him on Twitter at @blgranucci and visit his Facebook page. 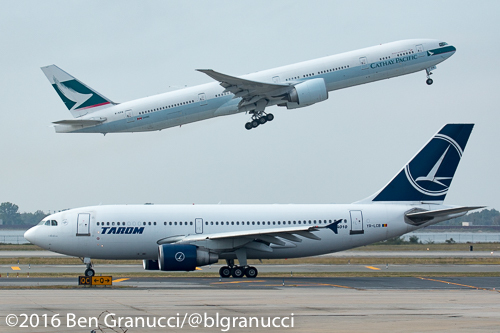 A Tarom A310 carrying the Hungarian delegation taxis to depart while a Cathay Pacific 777-300ER lifts off in the background during UN Week 2015. 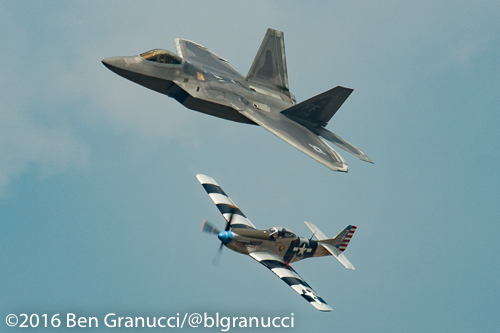 An F-22 Raptor and P-51 Mustang perform the Heritage Flight during day 2 of the first ever New York Air Show. 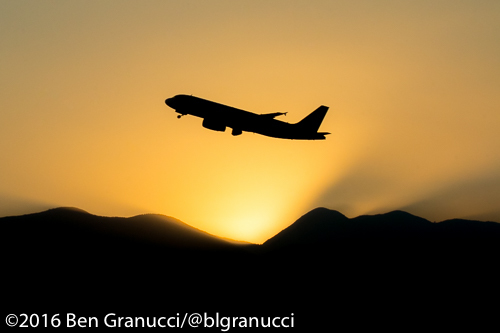 A LAN Airlines A320 departs Santiago, Chile at sunset. The Spirit Airlines board announced that board member Robert Fornaro would replace Ben Baldanza as the CEO of the ultra low-cost airline. Fornaro was the AirTran CEO who managed the sale to Southwest 2011. While Spirit remains profitable, it is less so than before, and stock prices have tumbled. Could there be a merger in Spirit’s future? Will a Change of CEOs Mark a Change of Spirit for US’s Low-Cost Market? Where Will New CEO Take Spirit Airlines? 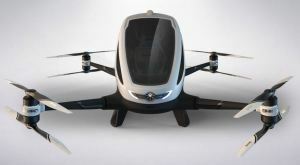 China-based EHang announced its EHang 184 autonomous electric drone at CES, and says it should be in production in a year. The aircraft carries a single passenger, is limited to a 23 minute flight, and is expected to have a price of $200,000-$300,000. The U.S. Transportation Department Office of the Inspector General released a report saying the FAA is not ensuring that airline pilots maintain the skills they need to take control from automated systems during an unexpected event. Qantas ferried a Rolls Royce engine from Sydney to Johannesburg so it could be used on another B747. See the video: Qantas’ Five-Engined Boeing 747-400 Ferry Flight Takes Off From Perth. 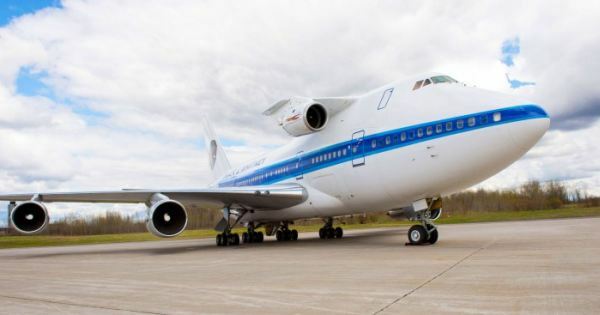 Some years ago, Aviation Week covered Pratt & Whitney’s 747SP flying testbed with a “fifth engine” GTF. P&W B747SP flying testbed with the PW1200G. Source: Pratt & Whitney. David tells us about the ugliest airplane ever, the Northrop Tacit Blue. 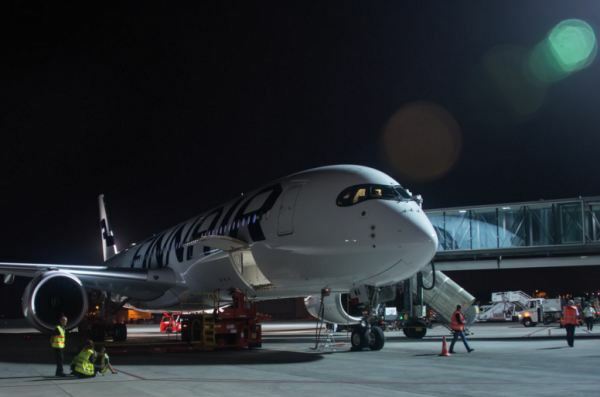 Pieter talks to FlightChic Marisa Garcia about the A350, Finnair, RyanAir and the sad new unfolding of an accident in Sweden. The 3 Plane Crashes You’ve Never Heard Of: Aviation’s Sacrificial Lambs by Phil Derner Jr. in NYCAviation. Jack Dunn Stories – Stories from a long time aviator, captured in video. Tracey Curtis-Taylor finishes UK to Australia biplane flight – Tracey Curtis-Taylor flew her 1942 Boeing Stearman Spirit of Artemis from Farnborough to Sydney, retracing pioneer Amy Johnson’s 1930 flight. This entry was posted in Episodes and tagged CES, drone, FAA, flight training, Pratt & Whitney, Qantas, Spirit Airlines, Spotting, Tacit Blue on January 13, 2016 by maxflight.